We see an increasing amount of millennials present on social media who are demanding more eye-catching visuals and less long, boring paragraphs of text. Since businesses only have about five seconds to grab the audiences’ attention with an appealing headline, marketers are trying to keep up with this fast-paced generation through highly prominent social media platforms. 75% of users outside the United States. In the second half of 2017, Instagram ads increased by 28%! So why choose Instagram over other social media? People browse through Instagram and click “Follow” on accounts that correlate with their personal interests and passions—from traveling to food to automobiles to trending fashion to arts and entertainment. Advertisers are simply trying to connect active users with what they love. Keep in mind that the goal is to link businesses to the right people. To do so, marketers must cater Instagram advertisements to a target audience which will benefit both sides. Viewers are more equipped with knowledge about a specific product or service and can easily take direct initiative to purchase a product, download an app, or sign up on the website specified by the ads. Well, you may wonder, “where’s the proof?” These three success stories serve as testimonies of the magic of Instagram ads. 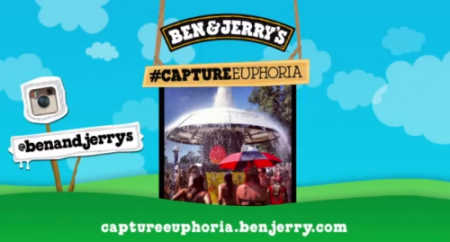 The acclaimed ice cream and frozen dessert company ran an 8-day Instagram Ad campaign. 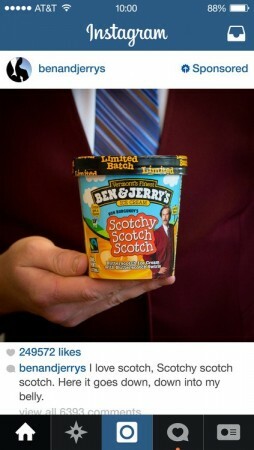 Four distinct photos featuring the new ice cream flavor “Scotchy Scotch Scotch” were posted. The goal was to promote its upbeat brand and bring awareness for its new flavor to its target audience of 18 – 35 years old living in the U.S. The results were astonishing. 9.8 million people saw the ad and 33% of those who saw more than one ad recalled seeing a Ben & Jerry’s ad. As the first Australian airline to run both photo and video campaigns on Instagram, the aviation brand aimed to make a personable connection with the sentimental feeling of traveling back home. They reached out to the Instagram community of 18 to 34-year-old travel-savvy millennials. 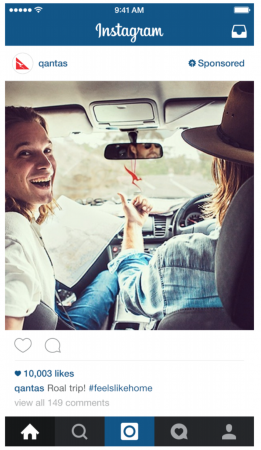 Their “Feels Like Home” Instagram campaign featured favorite summer moments that would bring about a nostalgic reaction from the target audience, such as planning a road trip or surfing with friends. 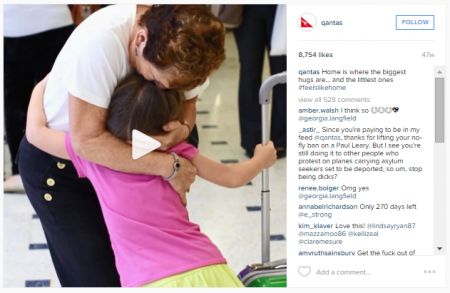 To top it off, Qantas also incorporated emotional 15-second videos depicting real-life scenes of people reuniting with loved ones at the airport. Again, the outcome was positive and resulted in strong brand awareness for Qantas. Last but not least, we have our own success story! We tested our Instagram ads, posting pictures of our employees to express a more personal and inviting aura for our target audience consisting of small business owners. By showcasing what we have to offer and how we can improve their companies, we successfully drove leads to our landing page. There is one thing all of these three businesses listed above have in common: that is, they all have tailored images and concise content that will immediately grab the attention of the target audience. With a powerful social media platform as visually appealing as Instagram, it is almost impossible to not be able to captivate viewers and gain brand recognition. Last but not least, start thinking video if you haven’t already. 25% of all Instagram ads are single videos. People are consuming videos on Instagram and you have an opportunity to make story videos or a regular 60 second video ad. The resources to help businesses successfully market their brands are already prepackaged and delicately gift wrapped, ready to be delivered. It all boils down to the question, “Is it worth the time to invest and take advantage of these given resources?” And it should be a simple, no-brainer “Yes!” as validated by these top brands. 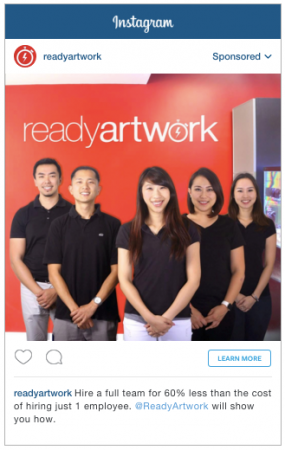 To learn more about the benefits of Instagram ads for your business, please contact us at 626-400-4511 or info@readyartwork.com.